Product patented, used by doctor's company sets it apart in a competitive industry, owner reports. As P.A. Bailey approached her 60s, she knew it was just a matter of time before she would begin losing her hair. "My mother was bald in her 60s. My grandmother was bald starting in her 60s," she said. When the inevitable happened, the retired office worker was still devastated. But thanks to Dr. Sandra Brown at Hair & Skin Rejuvenation Inc., Bailey is feeling much better. 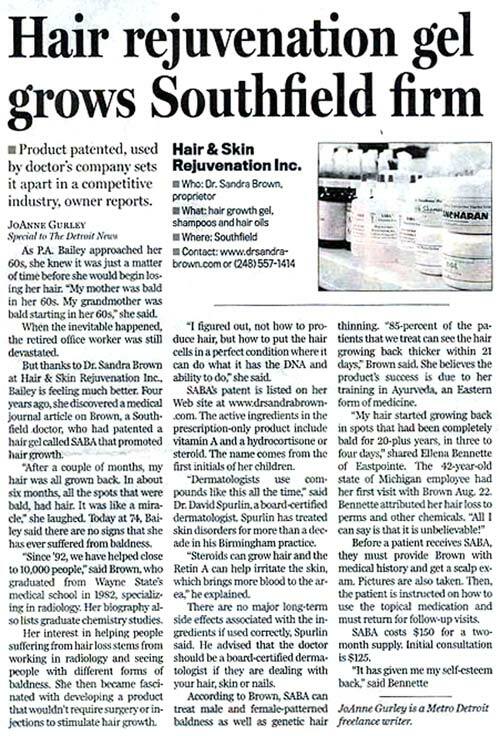 Four years ago, she discovered a medical journal article on Brown, a Southfield doctor, who had patented a hair gel called SABA that promoted hair growth. "After a couple of months, my hair was all grown back. In about six months, all the spots that were bald, had hair. It was like a miracle," she laughed. Today at 74, Bailey said there are no signs that she has ever suffered from baldness. "Since '92, we have helped close to 10,000 people," said Brown, who graduated from Wayne State's medical school in 1982, specializing in radiology. Her biography also lists graduate chemistry studies. Her interest in helping people suffering from hair loss stems from working in radiology and seeing people with different forms of baldness. She then became fascinated with developing a product that wouldn't require surgery or injections to stimulate hair growth. "I figured out, not how to produce hair, but how to put the hair cells in a perfect condition where it can do what it has the DNA and ability to do," she said. SABA's patent is listed on her Web site at www.drsandrabrown.com. The active ingredients in the prescription-only product include vitamin A and a hydrocortisone or steroid. The name comes from the first initials of her children. "Dermatologists use compounds like this all the time," said Dr. David Spurlin, a board-certified dermatologist. Spurlin has treated skin disorders for more than a decade in his Birmingham practice. "Steroids can grow hair and the Retin A can help irritate the skin, which brings more blood to the area," he explained. There are no major long-term side effects associated with the ingredients if used correctly, Spurlin said. He advised that the doctor should be a board-certified dermatologist if they are dealing with your hair, skin or nails. According to Brown, SABA can treat male and female-patterned baldness as well as genetic hair thinning. "85-percent of the patients that we treat can see the hair growing back thicker within 21 days," Brown said. She believes the product's success is due to her training in Ayurveda, an Eastern form of medicine. "My hair started growing back in spots that had been completely bald for 20-plus years, in three to four days," shared Ellena Bennette of Eastpointe. The 42-year-old state of Michigan employee had her first visit with Brown Aug. 22. Bennette attributed her hair loss to perms and other chemicals. "All I can say is that it is unbelievable!" Before a patient receives SABA, they must provide Brown with medical history and get a scalp exam. Pictures are also taken. Then, the patient is instructed on how to use the topical medication and must return for follow-up visits. SABA costs $150 for a two-month supply. Initial consultation is $125. JoAnne Gurley is a Metro Detroit freelance writer.